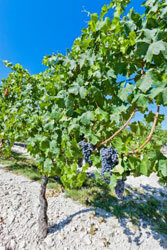 Grapes are very adaptable to various types of soil but to produce the highest quality wine, specific types are required. In lush fertile soil, Zinfandel will over produce a bland characterless wine unless large quantities of the fruit are removed during the growth period. It produces better fruit when its forced to struggle. There are no clear-cut distinctions on how soil affected wine characteristics. Most theories lean to the texture of the soil and how it affects the vines is able to take in water. Minerals do affect wine flavor however. The Stags Leap area of Napa Valley often produce wine with a slightly peppery flavor. Many Pinot Noirs from wineries in the Cascade mountain range of Oregon have a similar pepper flavor. What they have in common are soils rich in volcanic material. To find wines that grow in a specific soil type, click on the “Encyclopedia Varietal Report” button, (2nd button down on the left) and use Winery-Sage.com’s powerful database and filter tools to find the perfect Varietals.